1 D None No Power Seat 1 D is a standard Business Class seat however, the proximity to the galley may be bothersome. 1 G None No Power Seat 1 G is a standard Business Class seat however, the proximity to the galley may be bothersome. 21 A None No Power Seat 21 A is a standard Premium Economy Class seat that has additional legroom. There is no floor storage for this seat during takeoff and landing. The tray table is in the armrest, making the armrest immovable and slightly reducing seat width. 21 B None No Power Seat 21 B is a standard Premium Economy Class seat that has additional legroom. There is no floor storage for this seat during takeoff and landing. The tray table is in the armrest, making the armrest immovable and slightly reducing seat width. 21 C None No Power Seat 21 C is a standard Premium Economy Class seat that has additional legroom. There is no floor storage for this seat during takeoff and landing. The tray table is in the armrest, making the armrest immovable and slightly reducing seat width. 21 D None No Power Seat 21 D is a standard Premium Economy Class seat that has additional legroom. There is no floor storage for this seat during takeoff and landing. The tray table is in the armrest, making the armrest immovable and slightly reducing seat width. 21 E None No Power Seat 21 E is a standard Premium Economy Class seat that has additional legroom. There is no floor storage for this seat during takeoff and landing. The tray table is in the armrest, making the armrest immovable and slightly reducing seat width. 21 G None No Power Seat 21 G is a standard Premium Economy Class seat that has additional legroom. There is no floor storage for this seat during takeoff and landing. The tray table is in the armrest, making the armrest immovable and slightly reducing seat width. 21 H None No Power Seat 21 H is a standard Premium Economy Class seat that has additional legroom. There is no floor storage for this seat during takeoff and landing. The tray table is in the armrest, making the armrest immovable and slightly reducing seat width. 21 J None No Power Seat 21 J is a standard Premium Economy Class seat that has additional legroom. There is no floor storage for this seat during takeoff and landing. The tray table is in the armrest, making the armrest immovable and slightly reducing seat width. 21 K None No Power Seat 21 K is a standard Premium Economy Class seat that has additional legroom. There is no floor storage for this seat during takeoff and landing. The tray table is in the armrest, making the armrest immovable and slightly reducing seat width. 23 H None No Power Seat 23 H is a standard Premium Economy Class seat that may have limited recline. The proximity to the lavatory may be bothersome. 23 J None No Power Seat 23 J is a standard Premium Economy Class seat that may have limited recline. The proximity to the lavatory may be bothersome. 23 K None No Power Seat 23 K is a standard Premium Economy Class seat that may have limited recline. The proximity to the lavatory may be bothersome. 24 A None No Power Seat 24 A is a standard Premium Economy Class seat that may have limited recline. 24 B None No Power Seat 24 B is a standard Premium Economy Class seat that may have limited recline. 24 C None No Power Seat 24 C is a standard Premium Economy Class seat that may have limited recline. 24 D None No Power Seat 24 D is a standard Premium Economy Class seat that may have limited recline. The proximity to the lavatory and galley area may be bothersome. 24 E None No Power Seat 24 E is a standard Premium Economy Class seat that may have limited recline. The proximity to the lavatory and galley area may be bothersome. 24 G None No Power Seat 24 G is a standard Premium Economy Class seat that may have limited recline. The proximity to the lavatory and galley area may be bothersome. 41 A None No Power Seat 41 A is a standard Economy Class seat that has extra legroom due to the exit however, the Exit Door protrusion may be bothersome. There is no floor storage for this seat during takeoff and landing. The tray table and inflight entertainment monitor are in the armrest, making the armrest immovable and slightly reducing seat width. 41 B None No Power Seat 41 B is a standard Economy Class seat that has extra legroom due to the Exit. There is no floor storage for this seat during takeoff and landing. The tray table and inflight entertainment monitor are in the armrest, making the armrest immovable and slightly reducing seat width. 41 C None No Power Seat 41 C is a standard Economy Class seat that has extra legroom due to the Exit. There is no floor storage for this seat during takeoff and landing. The tray table and inflight entertainment monitor are in the armrest, making the armrest immovable and slightly reducing seat width. 41 D None No Power Seat 41 D is a standard Economy Class seat that has extra legroom due to the exit however, the proximity to the lavatory and galley area may be bothersome. There is no floor storage for this seat during takeoff and landing. The tray table and inflight entertainment monitor are in the armrest, making the armrest immovable and slightly reducing seat width. 41 E None No Power Seat 41 E is a standard Economy Class seat that has extra legroom due to the exit however, the proximity to the lavatory and galley area may be bothersome. There is no floor storage for this seat during takeoff and landing. The tray table and inflight entertainment monitor are in the armrest, making the armrest immovable and slightly reducing seat width. 41 G None No Power Seat 41 G is a standard Economy Class seat that has extra legroom due to the exit however, the proximity to the lavatory and galley area may be bothersome. There is no floor storage for this seat during takeoff and landing. The tray table and inflight entertainment monitor are in the armrest, making the armrest immovable and slightly reducing seat width. 41 H None No Power Seat 41 H is a standard Economy Class seat that has extra legroom due to the Exit. There is no floor storage for this seat during takeoff and landing. The tray table and inflight entertainment monitor are in the armrest, making the armrest immovable and slightly reducing seat width. 41 J None No Power Seat 41 J is a standard Economy Class seat that has extra legroom due to the Exit. There is no floor storage for this seat during takeoff and landing. The tray table and inflight entertainment monitor are in the armrest, making the armrest immovable and slightly reducing seat width. 41 K None No Power Seat 41 K is a standard Economy Class seat that has extra legroom due to the exit however, the Exit Door protrusion may be bothersome. There is no floor storage for this seat during takeoff and landing. The tray table and inflight entertainment monitor are in the armrest, making the armrest immovable and slightly reducing seat width. 42 D None No Power Seat 42 D is a standard Economy Class seat that may have restricted legroom due to the position of the bulkhead. There is no floor storage for this seat during takeoff and landing. 42 E None No Power Seat 42 E is a standard Economy Class seat that may have restricted legroom due to the position of the bulkhead. There is no floor storage for this seat during takeoff and landing. 42 G None No Power Seat 42 G is a standard Economy Class seat that may have restricted legroom due to the position of the bulkhead. There is no floor storage for this seat during takeoff and landing. 59 C None No Power Seat 59 C is a standard Economy Class seat however, other flyers tend to bump into this seat. The proximity to the lavatories may be bothersome. 59 D None No Power Seat 59 D is a standard Economy Class seat however, the proximity to the lavatories may be bothersome. 59 E None No Power Seat 59 E is a standard Economy Class seat however, the proximity to the lavatories may be bothersome. 59 G None No Power Seat 59 G is a standard Economy Class seat however, the proximity to the lavatories may be bothersome. 59 H None No Power Seat 59 H is a standard Economy Class seat however, other flyers tend to bump into this seat. The proximity to the lavatories may be bothersome. 60 A None No Power Seat 60 A is a standard Economy Class seat however, the proximity to the lavatories may be bothersome. 60 B None No Power Seat 60 B is a standard Economy Class seat however, the proximity to the lavatories may be bothersome. 60 J None No Power Seat 60 J is a standard Economy Class seat however, the proximity to the lavatories may be bothersome. 60 K None No Power Seat 60 K is a standard Economy Class seat however, the proximity to the lavatories may be bothersome. 61 D None No Power Seat 61 D is a standard Economy Class seat that has extra legroom due to the exit however, the proximity to the lavatory area may be bothersome. There is no floor storage for this seat during takeoff and landing. The tray table and inflight entertainment monitor are in the armrest, making the armrest immovable and slightly reducing seat width. 61 E None No Power Seat 61 E is a standard Economy Class seat that has extra legroom due to the exit however, the proximity to the lavatory area may be bothersome. There is no floor storage for this seat during takeoff and landing. The tray table and inflight entertainment monitor are in the armrest, making the armrest immovable and slightly reducing seat width. 61 G None No Power Seat 61 G is a standard Economy Class seat that has extra legroom due to the exit however, the proximity to the lavatory area may be bothersome. There is no floor storage for this seat during takeoff and landing. The tray table and inflight entertainment monitor are in the armrest, making the armrest immovable and slightly reducing seat width. 62 A None No Power Seat 62 A is a standard Economy Class seat that has extra legroom due to the exit however, the Exit Door protrusion may be bothersome. There is no floor storage for this seat during takeoff and landing. The tray table and inflight entertainment monitor are in the armrest, making the armrest immovable and slightly reducing seat width. 62 B None No Power Seat 62 B is a standard Economy Class seat that has extra legroom due to the Exit. There is no floor storage for this seat during takeoff and landing. The tray table and inflight entertainment monitor are in the armrest, making the armrest immovable and slightly reducing seat width. 62 C None No Power Seat 62 C is a standard Economy Class seat that has extra legroom due to the Exit. There is no floor storage for this seat during takeoff and landing. The tray table and inflight entertainment monitor are in the armrest, making the armrest immovable and slightly reducing seat width. 62 H None No Power Seat 62 H is a standard Economy Class seat that has extra legroom due to the Exit. There is no floor storage for this seat during takeoff and landing. The tray table and inflight entertainment monitor are in the armrest, making the armrest immovable and slightly reducing seat width. 62 J None No Power Seat 62 J is a standard Economy Class seat that has extra legroom due to the Exit. There is no floor storage for this seat during takeoff and landing. The tray table and inflight entertainment monitor are in the armrest, making the armrest immovable and slightly reducing seat width. 62 K None No Power Seat 62 K is a standard Economy Class seat that has extra legroom due to the exit however, the Exit Door protrusion may be bothersome. There is no floor storage for this seat during takeoff and landing. The tray table and inflight entertainment monitor are in the armrest, making the armrest immovable and slightly reducing seat width. 78 A None No Power Seat 78 A is a standard Economy Class seat located in a last row of the aircraft. Seat back recline might be limited due to the wall directly behind. Also, if the seat back in front is reclined, then personal space will be reduced. The proximity to the galley and lavatory area might be bothersome. 78 C None No Power Seat 78 C is a standard Economy Class seat located in a last row of the aircraft. Seat back recline might be limited due to the wall directly behind. Also, if the seat back in front is reclined, then personal space will be reduced. The proximity to the galley and lavatory area might be bothersome. 78 D None No Power Seat 78 D is a standard Economy Class seat located in a last row of the aircraft. Seat back recline might be limited due to the wall directly behind. Also, if the seat back in front is reclined, then personal space will be reduced. The proximity to the galley and lavatory area might be bothersome. 78 E None No Power Seat 78 E is a standard Economy Class seat located in a last row of the aircraft. Seat back recline might be limited due to the wall directly behind. Also, if the seat back in front is reclined, then personal space will be reduced. The proximity to the galley and lavatory area might be bothersome. 78 G None No Power Seat 78 G is a standard Economy Class seat located in a last row of the aircraft. Seat back recline might be limited due to the wall directly behind. Also, if the seat back in front is reclined, then personal space will be reduced. The proximity to the galley and lavatory area might be bothersome. 78 H None No Power Seat 78 H is a standard Economy Class seat located in a last row of the aircraft. Seat back recline might be limited due to the wall directly behind. Also, if the seat back in front is reclined, then personal space will be reduced. The proximity to the galley and lavatory area might be bothersome. 78 K None No Power Seat 78 K is a standard Economy Class seat located in a last row of the aircraft. Seat back recline might be limited due to the wall directly behind. Also, if the seat back in front is reclined, then personal space will be reduced. The proximity to the galley and lavatory area might be bothersome. All Business Class seats have access to an AC power port. There is no power available in Premium Economy and Economy Class. Wi-Fi connectivity is available to all passengers aboard this aircraft. This Airbus A330-300 features a three class configuration with 18 flat bed Business Class seats, 33 Premium Economy seats with up to 3” of extra legroom, and 312 standard Economy Class seats. This plane offers GSM and Wi-Fi access to allowing passengers to browse the web, make phone calls, or stream content via their personal devices. 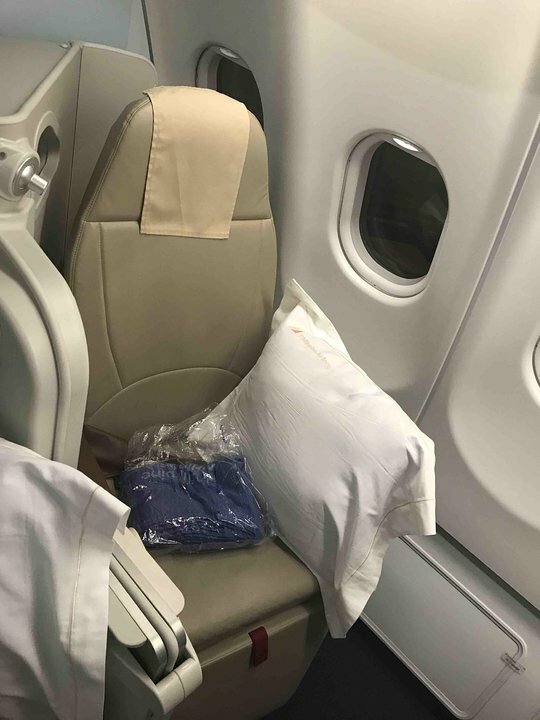 The unusual tight-fitting of business class seats on Manila-Dammam-Manila route. I don't know why they have these business class seats configuration for Middle East flights. But they have a lot better business seats for a shorter flight like Manila -Hongkong flights. Besides there is no built-in entertainment screen you were given an ipad where it caused neck strain throughout the flight. What a horrible experience on this plane. SYD-MAN on a day flight in 2C. A strange set up with 2A angled towards 2C. A seat full reclines into a flat bed but with very limited space (length and width) for a largish Caucasian. It may be OK for a small Filipino. The seat next to mine also reclines into a flat bed but a higher level so it looks and feels strange. The only advantage is that a passenger in 2A may have easier access to the isle being higher than the 2C seat. No IFE via individual fixed screens but one can use an iPad distributed by the crew. A single toilet serving 18 business class passengers and often an overflow of premium economy passengers. The toilet very small but it may be the future of current layout of planes. I highly doubt that the economy seats on this aircraft are 18 inches wide, as shown in the "seating details" on this page. I'd be surprised if they were even 17 inches wide, given the high-density 9-abreast configuration used. Fixed armrest on the bulkhead premium economy seat makes the narrow seat very confining for many people. Strange set up--the two seats were angled towards each other--I had an empty seat beside me, otherwise it would have been a bit odd. I found the seat small and tight and the foot rest for the passenger beside me had there been one was up around my head area--was it supposed to drop ? Uncomfortable, and had it not been a short flight I would have been unhappy. This seat is perfect if you are tall. You can sit with an angle and stretch your legs on the side. Additionally, you have the advantage of being in the aisle (getting out of your seat anytime) without having people bumping into you. Flew from Melbourne to manila and return on this plane, the A340's I they used to use on this flight were better than the A330, the economy seats we had were small and cramped no power for your devices what so ever seats were hard with no padding and with very little leg room, on the return flight to Melbourne they ran out of beef so had to be content with cold fish, never ever will I fly with Philippine airlines ever again from Melbourne, no regard what so ever for there passengers.